The season finale of Star Trek Discovery airs this week. I'm aware that the show is polarizing among Trek fans, but I have largely enjoyed the series since it's debut. I wish it was more widely available and not behind a paywall, but I'm fortunate to be in a position to pay for CBS All Access so I can watch the show. I've found Season 2 to be much better than Season 1 and very enjoyable. My favorite aspect of Discovery is the cast, which is fantastic from top to bottom. My biggest wish is that the show would slow down and let there be more moments between the characters instead of rushing from moment to moment; in fact, some of my favorite scenes have been the ones where the writers take their time. I'm eager to see how Season 2 ends, and where that might lead to Season 3. If you're a fan, check out the show; if you aren't, I'd urge you to give Season 2 a try. It's worth it! We had two regionals this past weekend, in West Melborne, Florida and Ypsilanti, Michigan. Daniel Matteson (OKCoyote) won the Cardassia Regional with a fun-looking Ferengi deck, while Jon Carter (pfti) took the field in Michican with a Borg deck. Both took time to answer my questions for the Road to Worlds interviews, which appear below. I haven't played constructed 1E since 2017 Worlds (I've played plenty of sealed) so I was knowingly out of practice. Since it was my first time playing in so long, I wanted something that wasn't ultra-competitive, that I would have fun playing. Empok Nor is a fun card that nobody has run in at least two years. I thought I might break it back out and give it a shot, maybe take players by surprise. I played a similar deck a few years ago (also using TNG Ferengi) and had fun with it. I enjoy picturing the smaller Ferengi toting around armloads of guns they have no business using. How did the relatively recent ban of QI or errata to Temporal Benefactor impact your deck choice? Hoped not to face battle or Benefactor. Sean O'Reilly (Jono)'s deck in the final round had some of both. Yeah, I played it once, many years ago, and took second place (I forgot to keep Quark's Isolinear Rods in play against Thomas Kamuira (bosskamiura) and he Computer Crashed my equipment downloads). One major change was the removal of the Mercenary Raiders engine, as the last time I played the deck was before that errata. I replaced this with more mission specialists to get personnel out more quickly, as well as more personnel that could be downloaded (such as Kivas Fajo and Calandra). Kivas Fajo was pretty exclusively the draw engine here, but Guest Quarters/Promenade Shops/The Traveler: Transcendence all helped a little. Admiral J.P. Hanson was in the deck as a possible download. If my opponent seeded anything under Empok Nor, I'd download him into play with Defend Homeworld/Temporal Micro-Wormhole as his double Leadership would be great for the likely Friendly Fire I'd expect to see. However, he never got used, as I never had anything seeded under Empok Nor. Universal missions always comes with the risk of mission theft. Were you worried about using five missions? Not a whole lot. I was hoping my opponent would be too confused trying to figure out what I was doing to try for them, and further hoped the high span and weird affiliation icons would be enough to deter them. I did pack an HQ: Defensive Measures just in case. Believe it or not, Birta. I found myself having difficulty staffing my D'Kora Transport on turn one, and so Birta with his command star ended up being my go-to Defend Homeworld download! It was a weird day for me, with a bye and two modified wins. One of those wins came from Sean O'Reilly blowing my ships up and holding me scoreless, but losing points to his own Quinn and my Lack of Preparation. I feel like I tripped, fell backwards, and stumbled into a victory, but I sure had fun playing this deck regardless of the outcome. Deck Title: Strike this mother...... out! I chose this deck for three reasons. 1) I wanted to try something new (and if I was going to learn Borg, I wanted to learn the craziest version). 2) I didn't have time to build my own deck. 3) It seemed a good counter to Robin's KCA deck. His deck is wicked fast, but shooting/assimilating it down could put a real damper on his day. 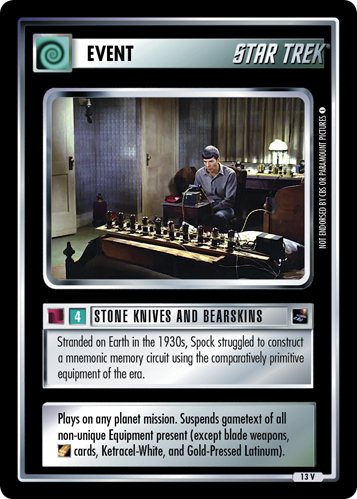 The only other deck I had in mind was my Vulcan Stop Kirk Contact Deck. But that would have needed serious dilemma reworking to be ready for all sorts of decks. Not a lot, this deck was already fine with QI and could mess with benefactor decks well. One (or main) ship decks are the easiest targets. A deck with lots of reporting locations and ships all over might be able to avoid the capacity of this deck to lock you down. MACOs are also good against Post Garrison, as they have Security for days to stop the Undetected Beam Ins. I was lucky against Aaron McCullough (aabecame) that I assimilated most of them before he could easily solve planets. Not at all. I had only played Borg once in a Road to Talos IV tournament. (Editor's Note: A Road to Talos IV tournament is one where the card pool is limited to sets from a particular era of the game. They start with just Premiere, and subsequent events add more expansions.) That was a closed cardpool of only First Contact and before, so it was a very different play experience. Asking Kevin Jaeger (Hoss-Drone) about how to play this type of deck, he said to mess with them first then go score points. This proved to be the pivotal advice. This not only let me build super-crews capable of plowing through most dilemmas but had the opponents on the back foot (if not conceding) most games. Stone Knives and Bear Skins was the hero. It prevented Jarrod Cafaro (Takket) from using all of the guns he downloaded and let me do some key assimilating. I haven't totally figured out the timing of Harness Particle 010 (never completed it in any of the games in testing or tournament). For me I need to either add some kind of probe rigging or just go alternative point scoring methods. This was an OTF Legacy tournament, but you didn't use any 1EC cards in your deck. Was there a particular reason? Were there any that you considered? Two reasons: 1) Time; simply put I did not have a good few weeks to remember what cards are out there. 2) I just don't know those cards. I have never really used them so they don't come to mind without a good search. Kev is a supreme deck builder. I am not sure I will play Borgs again, but this deck is a real multitool of trek. The only tournaments this past weekend were the two regionals, so let's dig into those events. Up first was the OTF Complete Constructed event in Florida, which as mentioned above was won by Daniel Matteson (OKCoyote). Five players enjoyed three rounds of Trek, and four different affiliations featured in the decks: Romulan (played twice), Ferengi, Hirogen, and Vulcan. Four of the five decklists are available, including runner-up Matthew McClain's (Indyguy1183) Romulan deck. Sean O'Reilly (Jono)'s Vulcan High Command took third place, but the scores were all close. It looks like it could have been anyone's event to win! On Sunday, four (4) players threw down in Ypsilanti, Michigan in the OTF Legacy Constructed tournament. Unfortunately, at the time of this writing, only Jon's Borg deck is available. However, Jon's also written a tournament report for the event, from which we can glean some more information. David Bowling (tomek) took full advantage of the backwards compatible cards to play a Voyager shuttle-drop deck, but ran into back luck against Jon's Borg. Aaron McCullough gave MACOs a shot, while Jarrod Cafaro was also playing Empok Nor, this time paired up with Klingons. It's a quiet weekend for First Edition with no scheduled tournaments taking place. If you and your friends are ever getting together to play Trek, be it a tournament, some deck building and chat, or just some kitchen table games, I'd be happy to feature it in this column. You can schedule it in our tournament software, or just contact me at the links at the bottom of every column. But looking ahead, we've got four (4) regional events across the globe over the next month. Next weekend, just after the release of Avengers: Endgame, there will be an OTF Constructed Complete regional in Roseville, Minnesota. The event currently features five (5) pre-registered players, not including tournament host Kris Sonsteby (LORE), but including the highest ranked player in the world, Kevin Jaeger (Hoss-Drone). Kevin's been the highest rated 1E player since May 2018, and is riding a twenty-four (24) game win streak. He's obviously the man to beat in Minnesota, but don't count out the other pre-registered players: Jeremy Huth (9of24), James Heaney (BCSWowbagger), Robin Bielefeldt (robbie4boy), and Justin Kaufman (CrimsonRavage). Anything might happen in this event, though the smart money is probably on Kevin. The following weekend features the start of an online regional, being hosted by Brian Sykes (Armus), and kicking off on Friday, May 3rd. To participate, you'll need to have Lackey and Skype, but it's otherwise free. Five (5) players are preregistered, including #3 ranked player Jon Carter, Michael Van Breemen (The Ninja Scot), Greg Dillon (Latok), Austin Chandler (DarkSabre) and some scrub - Charlie Plaine (MidnightLich). It should be fun! On Saturday, Johnny Holeva (jjh) is hosting an OTF TNG Block Sealed event. Here's his description of the event: "OTF Sealed TNG Starter Decks 2.0 + Premiere Pack (4) Draft $10 Entry. This is the PERFECT tournament for anyone who wants to have a fun afternoon hanging with friends, drafting packs, talking Trek, and playing no-stress 1E. I'll bring TNG Starter deck 2.0 printouts (FED, KLG, and ROM) for players and assign affiliations randomly before the draft. Please bring sleeves and card backers. We'll draft Premiere (4 packs) so you can customize your deck. And there will be a few surprises. Three rounds of TNG fun. Foil prizes for all from my Trade Box! $10 entry covers the printouts, packs, and Regional fee. Email me with any questions. Please pre-register. What better way to celebrate Star Wars Day in San Diego than at Casa de Holeva with friends?! Hope to see you Saturday May 4, 2019 @ Noon!" Sounds amazing! Finally, on Sunday, Paddy Tye (KazonPADD) is hosting the 2019 Beccles Bloodbath as a regional. Four (4) players, including the host and Alex Dixon (alexd), who are #13 and #14 in the world, will play and have a good day of Trek. Help me double check the high resolution errata file. For some time now, our automatically generated file of errataed cards has been out of synch with the high resolution version. I've recently completed the project of going through the files to synch them, and I'm looking for volunteers to double check my work. If you're interested, please jump onto the forum thread linked above and help me complete this update! Hurt and heal for First Edition deck factions is ongoing. Currently, the Vulcans are at the top and decks are at the bottom of the hurt and heal thread. If you aren't familiar, it's a ranking game where forum users can move one deck choice down a spot (hurt) and one up a spot (heal) each day. Right now, the list covers forty (40) different affiliations, sub-affiliations, and factions. Join in on the fun and get your rankings in! Do you have ideas for a Jem'Hadar only deck? New forum member Justice13 recently started a discussion about how to make a deck using only Jem'Hadar. Their original idea was to pair Jem'Hadar Birthing Chamber, Young Jem'Hadar, and New Arrivals for a steady stream of people. Others have chimed in with different ideas - what can you bring to the table? Or, what would you like to see be given to this deck in the future? Should weird Decipher-era decisions be revisited? Forum member Enabran propsed that the CC revisit the decision to give Major Rakal and Stefan DeSeve the alterate universe icon. It's long been an irritant to many Trek Sense purists that these personnel are marked as coming from a different time/universe when they clearly didn't. Decipher obviously made the decision to give these personnel the icon in Alternate Universe to give the affiliation some more options. What do you think? Should these oddities be cleaned up with errata? Or left alone, and possibly new versions made? Jon Carter's Stop Kirk Contact deck is now available! Jon Carter (pfti) recently won an online tournament with a Vulcan deck using Hero of the Empire; he's recently posted the deck and a discussion thread about it. It's fun looking, and Jon's even made a couple of suggestions for how to develop the deck further. Is it something you'd consider using? We want to see your decks! If you read the latest project status update, you'll know that our new expansion - The Cage - will be coming soon. It's focused on and brings some new toys to the Original Series factions. In advance of our spoiler season, we're curious to see your favorite existing decks. Put your deck into our system and send a link to me, your author, via email - to cplaine AT gmail DOT com - or via PM to MidnightLich. We might use your deck in a preview article for the new expansion, and if we do, you'll win three (3) copies of the new release foil, Preserver Obelisk! We've had one (1) submission so far, but would like some more! This time last year, we were smack dab in the middle of spoilers for Metamorphosis, the expansion that brought an end to converting backards compatible cards. I wrote an article about the Jack Pack (Jack, Lauren, Patrick, and Sarina from "Statistical Probabilities") including how the cards evolved from concept to finished product. Since their debut, they've shown up in a half dozen decks each, which is a good (but not great) showing. Five years ago, the final challenge for Make it So was set. In this challenge, finalists Adam Hegarty (Chewie) and James Monsebroten (Orbin) were tasked with creating their own fifteen (15) card virtual expansions, starting with picking their own design teams, setting the themes, and designing the cards. Ultimately, James Monsebroten (Orbin) would be the winner; his first expansion as an official lead designer, The Cage, will be releasing soon.